Energy audits are a key initial step in improving steam energy efficiency while reducing operations and maintenance (O&M) costs in commercial and industrial facilities. At SMS, we perform expert customized audits that uncover opportunities for maximizing energy and related savings. Our specialization in healthcare, schools and public buildings enables us to conduct meticulous audits that result in optimizing clients’ energy systems, saving both energy and O&M costs. In many locations, customers qualify for incentives and rebates that cover some or all of the cost of audits and equipment upgrades. We assist them in applying for these programs. 1) Plant Walk-Through is an on-site visit to identify potential opportunities where simple actions can improve energy performance and deliver immediate savings. This type of audit also entails a review of utility data to spot usage patterns and gauge savings opportunities. 2) Steam Energy Audit is a thorough survey of the steam condensate and distribution system is reviewed by a systems engineer. 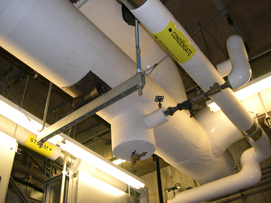 A systems engineer ensures that steam traps are located, tested, tagged and mapped. In addition, utility data is analyzed to identify the patterns of energy use, demand, and weather effects. Recommendations for optimizing steam energy performance are presented along with their respective payback rates. 3) Comprehensive Energy Audit is a detailed audit of the steam energy system within a building or across an entire campus. An energy systems engineer conducts a site visit to analyze boiler operations, the steam distribution and condensate return system, and all related equipment and controls. Steam traps are located, tested, tagged and mapped. Utility data is analyzed to determine usage/demand patterns and seasonal effects. Energy savings modeling is developed to measure potential impact of implementing recommendations. Opportunities are evaluated on the basis of net savings relative to “doing nothing” and/or alternative solutions. Savings-to-investment data is provided along with time-to-payback ratios and internal rates of return. As engineers specializing in steam distribution and condensate return systems, we have a deep understanding of our discipline gained through nearly a quarter century of serving commercial and light industrial clients. We know that upgrades to a facility’s energy infrastructure must compete for capital funding through various potential investment options including non-energy issues. At SMS, we provide rigorous engineering-based investment grade audits for justifying a wide range of projects. We may recommend our proven line of TECH-FITT products, if and where applicable, but our overarching goal is to conduct unbiased audits that benefit our customers and reflect the highest standards in our field. We believe that a solid investment case not only wins projects, it helps to sustain momentum throughout each project’s life cycle. The business case for capital investment, an output of the audit process, provides the client with a solid understanding of their needs that they can reference, even if issues arise during or after the project. At SMS, we bring together all that our engineers and analysts glean from audits to develop compelling arguments. » Let’s talk about how SMS services can help your company become a steam energy leader.